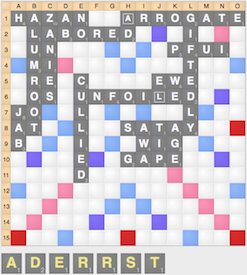 Twenty years ago, the concept of Scrabble valuation did not exist. People viewed points and leave as two completely different concepts that were extremely difficult to compare and quantify. 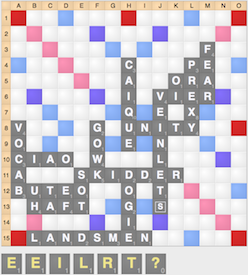 But today, the concept of Scrabble valuation is commonplace. People think of leave in terms of the potential ability to score on future turns, and have developed an intuitive idea of the worth of any leave. 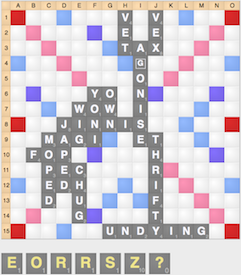 Today, Scrabble valuation is a well-understood and accepted concept. Valuation and entropy are not much different today than points and leave were twenty years ago. 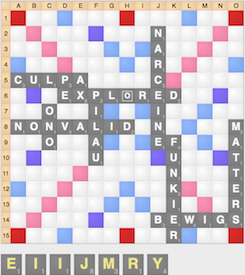 Entropy is a major consideration in any Scrabble position and is a factor of the game score, the board, and your rack. In every position, points and leave are important decision making factors; but so is entropy. In some positions, there will be plays where one play maximizes valuation, while another play still has a high valuation but has better entropy. Comparing these plays is extremely difficult, especially since unlike leave, it is very difficult to precisely quantify the entropy of any given position. Comparing valuation to entropy remains, at this time, a very imprecise science. 1. Valuation is always more important when the score is close (when you will be ahead by less than 30 points after your turn). In these situations, every point matters, and your ability to outscore your opponent if neither player plays a bingo (or both players play a bingo) is of the utmost importance. 2. If you are ahead between 30-60 points or if you are behind by 30 or less points after your turn, entropy is more important. In these cases, point spacing is much more important: you will not be able to withstand a bingo (in the short term) at these scores. 3. (Short-term) Entropy is more important if the game is nearly over. In these cases, the odds of your opponent outscoring you are often less than the handful of points you will be giving up. 4. Entropy is more significant if you can affect BOTH long term AND short term entropy at the same time in the correct manner. Being able to block both bingo lines and quadrants is extremely powerful. 5. Don’t make a play with a substantially lower valuation unless it’s really obvious to do so. Remember, the best way to beat a potential bingo is to outscore the bingo, whenever possible. 6. In the early stages, long term entropy is more significant than short term entropy. 7. The valuation/entropy relationship is concave: thus, small differences in both valuation and entropy favor entropy, while large differences in both valuation and entropy favor valuation. In these two positions, entropy is very important, as you will have a lead after your turn and different bingos will allow you to have a significant impact on board entropy. Because of this, you are better off playing TRADERS in diagram 1 and sTERILE in diagram 2 to reduce entropy, even though both plays sacrifice points. In these two positions, valuation is more important. There are too many high scoring options, both next turn and on future turns to sacrifice a significant number of points to affect entropy. Because of this, you should play ZEROS in diagram 1 and JERKY in diagram 2, since they have significantly higher valuations.